Although baking a pizza is a relatively simple process, baking a frozen pizza to perfection does require attention to detail if you want a delicious tasting pie. From completely preheating the oven to proper baking time and ‘resting’, baking a pizza starts by paying attention to details. Our packaging on Chanticlear Frozen Pizzas includes baking instructions, which for most pizzas, requires preheating the oven to 450 degrees. And that means all the way to 450 degrees! Oftentimes people are so excited to eat their pizza that they cut a corner and think if they stick the pizza in the oven early, during the preheat, that it will simply get done faster. Not true. Putting a pizza into the oven before it is completely preheated will result in a poorly baked pizza and won’t allow the pie to cook evenly, resulting in an undercooked and/or a poor tasing pizza. When baking your Chanticlear Frozen Pizza, place the pizza in the middle of the rack, preferably on a rack on the middle shelf of the oven. Our pizzas cook quickly and depending on the exact type of oven, may be done as soon as eight or nine minutes. Check the pizza at seven minutes and time it out from there. Many pizza lovers might think that they need to rotate the pizza in the oven. This is something you may see being done when cooking in a pizza oven, but it is not required in standard ovens such as the one you have in your home. The use of a pizza stone may also seem like an authentic thing to do, but it will require heating the stone to the specified oven temp, which at 450 degrees will take you about two hours. Use of a pizza stone might seem cool, but it is totally impractical. Metal trays are also something people like to cook their frozen pizza on, however we’d advise against this. 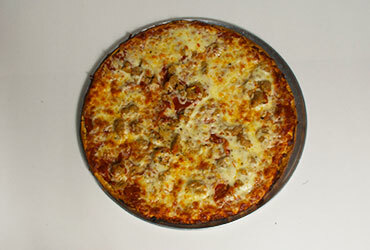 Typically a tray is used to catch any thing that runs off of the pizza but since all of our ingredients are top quality, including 100% Wisconsin mozzarella cheese is grated right off the block daily, you will not have issues with sauce or toppings finding their way to the bottom of your oven. If a pizza is dripping all over the place, smoking up the kitchen and setting off your smoke alarms, it’s time you discovered Chanticlear Frozen Fresh Pizza! Finally, when the pizza is done and it’s time to take it out of the oven, let it rest for a few minutes before cutting and serving. This will allow the pizza to set up and hold together during slicing. It will also save the roof of your mouth from being burnt (we’ve all been there right?). Congratulations! Eating and enjoying your perfectly cooked Chanticlear frozen fresh pizza is the final step in the process. Next time your are baking a frozen pizza, follow these simple but important tips and enjoy your Chanticlear Frozen Pizza!